Johnny Shaw is the author of the Spotted Owl Award–winning Jimmy Veeder Fiasco series of novels—including Plaster City and Dove Season—as well as the Anthony Award–winning adventure novel Big Maria. His new novel Floodgate will be published in February 2016 by Thomas & Mercer. 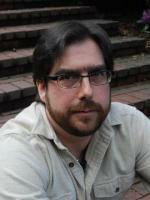 His short fiction has appeared in Thuglit, Crime Factory, Shotgun Honey, Plots with Guns, and various anthologies. He was the creator and editor of the hard-boiled fiction magazine Blood and Tacos. Johnny lives in Portland, Oregon. Got a manuscript you can't crack? Stalled on your screenplay? In this four-week workshop, Johnny Shaw will teach you the art of the rewrite—where the real magic happens.